I have to confess that I approached this book with a significant amount of hesitation. After the whole Twilight fiasco, I have deliberately avoided all vampire books. However when recently visiting my cousin Kim (the same cousin who dared me to read Twilight; but who also usually has very similar taste in books to me), she loaned me a stack of books including this one. She understood my trepidation (which is why I only took the first book in the series), but assured me that this was likely much more my style than Twilight. 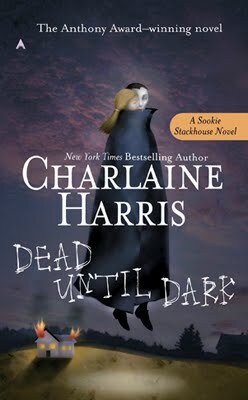 For anyone who doesn't know, this is the first book in the Southern Vampire Mystery series featuring Sookie Stackhouse that has recently been made into the TV programme True Blood. I did enjoy this book, so thank you Kim for convincing me to read it and lending me your copy! I only wish that I had borrowed the rest of the series when you offered (though my co-worker has now offered to lend her copies to me). Really, the only think that this book had in common with Twilight is the fact that one of the romantic leads is a vampire. First of all, the book doesn't take itself too seriously. There is a definite vein of humour running through it. Secondly, Sookie is a much more like-able and less spineless (sorry for the double negative!) heroine than Bella. I actually found myself relating to her throughout the book! I heard the author interviewed by Jian Ghomeshi on Q (CBC radio) earlier this summer before I had read this book, and while reading, I could hear her voice throughout with her soft southern accent. Plot? Sookie is a mind-reader in small town Louisiana who finds herself intrigued by the new man in town, Bill, who also happens to be a vampire. As several bodies turn up, she finds herself drawn into the vampire world. Almost a cross between a murder mystery novel, a romance, and a paranormal fantasy. With a generous dash of humour thrown in.